Two weeks ago, we reported that Senheng have started to take pre-order for Samsung Galaxy Tab 3 10.1 LTE even though Samsung Malaysia themselves have yet to officially announce any plans for the tablet. If you one of those that have actually pre-ordered the device or planning to check it out at your favourite retailers, we have a good news for you then. 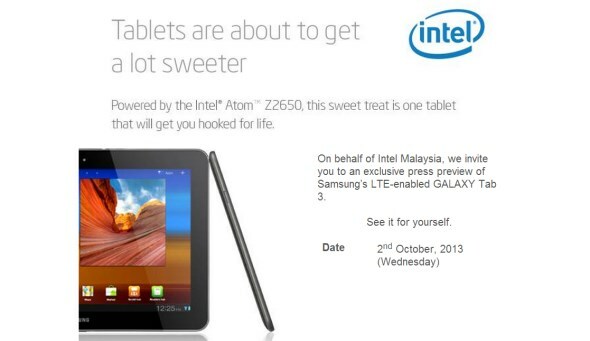 Just moments ago, we have received an invite from Intel Malaysia (shown above, excuse the typo on the processor’s name) for an upcoming press event for the Intel-powered tablet on 2 October. This pretty much means only one thing: the Galaxy Tab 3 10.1 LTE is finally confirmed for our market. Equipped with 1.6GHz Intel Atom Z2560 dual-core processor (also known as Clover Trail+) and 1GB of RAM, Senheng listed the 10.1-inch LTE tablet at RM 1,599 for the 16GB model. Let’s see how accurate that price tag will be when the product receives its official launch next week.